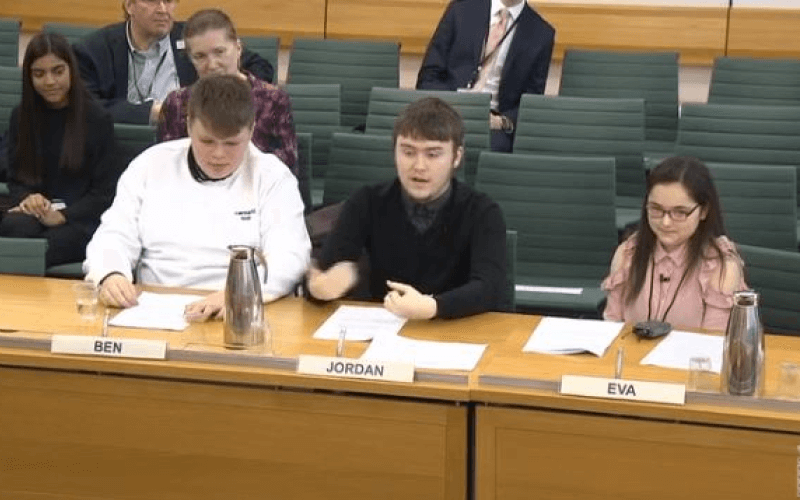 The committee heard from seven disabled young people on Tuesday as part of its inquiry into the impact of the special educational needs and disabilities (SEND) reforms introduced by the government through its Children and Families Act 2014*. Three of them – Jordan, Ben and Eva (pictured, centre, left and right) – were part of the RIP: STARS research team, a project led by disabled young people and researchers at Coventry University, which also included support from The Alliance for Inclusive Education, and looked at the quality of EHCPs and whether they met disabled children and young people’s rights. Jordan said some of their findings had been “stunning”, and that he and many other disabled young people “feel we were cheated out of the education system and treated poorly by them”. He said they made the “atrocious” discovery that disabled children “weren’t actually being involved in the process of their EHCPs”, with the main discussions taking place “without talking to the child themselves”. 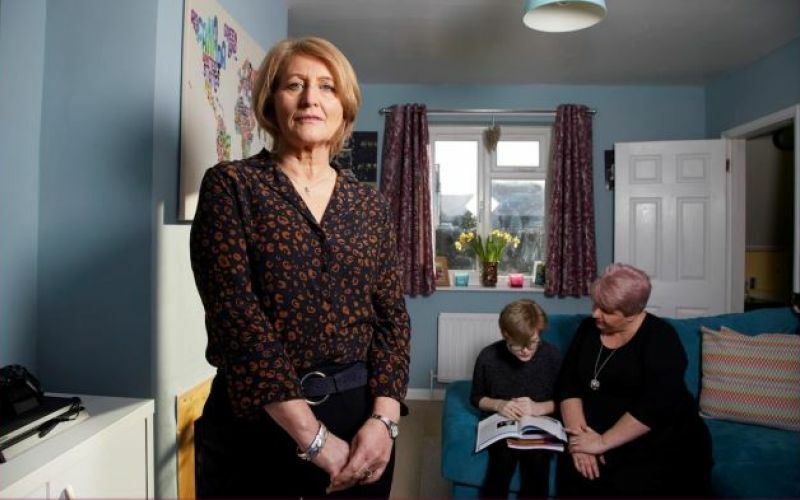 He said plans were “either being delayed, mistaken, poorly done and they are not meeting the needs of the child”, and he called for something to be done to ensure that plans “are being carried out correctly by staff” and “not just ignored and forgotten”. She said the plans were not preparing disabled children and young people for independence and adulthood. Eva said the plans should use the language of the social model of disability “so children are not defined by labels and they are not seen as a problem”. He said it was not right that disabled pupils who do not fit in with the “norms and roles and rules of education” were often “shipped off, excluded, offloaded, or hidden in other places” and “forgotten about”. Francesca, one of two deaf pupils on the National Deaf Children’s Society’s (NDCS) young people’s advisory board who gave evidence, told the committee that a lack of support at school meant she missed out on social situations and on learning “how to be confident and empowered”. She said she had even been encouraged to use a separate “SEND room” at lunch, which also made it harder to build friendships with non-disabled pupils. She said: “It’s showing to the other students that these people need to be kept separate, which I feel is the wrong attitude completely. Francesca said that meetings about EHCPs sometimes happened without the disabled young person being present. Another member of the NDCS advisory board, Ella, said she was “really struggling” to secure the support she needed through the EHCP process, with the local council currently refusing to provide her with a plan because it did not think she was deaf enough. As a result, she said, her grades were “far below what they should be”. And she said the only people the council would listen to were her parents, and not her. Simran, who is studying accountancy and management at Queen Mary University of London and was with the charity my AFK, said: “As a disabled woman, I have to work harder than everyone else to achieve anything. “I think it’s a great shame that young people with SEND are left unsupported and their achievements are unappreciated. Kashifa, who is studying at college and was also with my AFK, said she had received “a lot more support” when she was at school. She said: “Even though we had meetings about me going to college, I’m not sure they really understood my needs when I got there. “I think people make a judgement about what you’re capable of based on your appearance. She added: “I don’t need people to tell me I need to be realistic, either. “I want to work things out for myself and then be able to make the choice. *Under government reforms which came into effect in September 2014, local authorities in England had until April 2018 to move all disabled children and young people eligible for support from SEN statements to new EHCPs. The plans last from birth to the age of 25 and set out all the support they should receive across education, health and social care.